DAMN IF THOSE CHURCH LADIES DIDN’T DO IT AGAIN. SON OF A B—-! Just what in the name of Mary Magdalene does a girl gotta do to win at the Unofficial St. Joseph Altar Death-Match Bake-Off?! 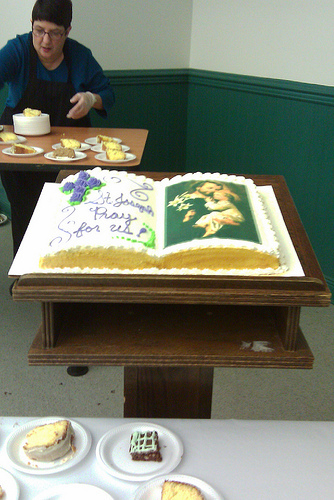 “I cannot believe you just used the word ‘G.D.’ in a church fellowship hall,” The Guy lamented. Well, he’s not the one who waited five years for his big comeback, only to be bested by a Bible-shaped cake with a portrait of St. Joseph airbrushed onto it. That’s just dirty pool, am I right?! –You really don’t want to know what Katie and I came up with. “I’m not a Christian,” Andrew said, “And I find that offensive.” Let’s just say it involved a lot of red jelly and leave it at that. What can I say? The spirit of competition got away with us. “You are so Bree Van de Kamp right now,” Holt said. All I know is, I think I’m gonna need a set of those biblical Legos. 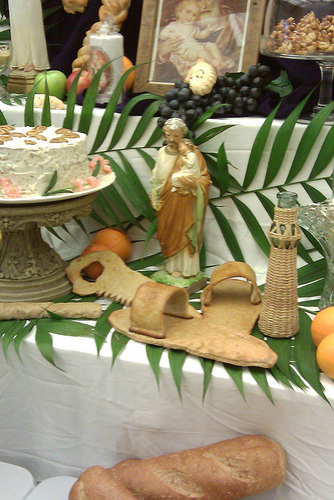 On the whole, though, despite my initially very un-Christian attitude toward my fellow bakers, The Guy enjoyed his first St. Joseph Altar experience. The braided bread shaped like the crown of thorns (complete with toothpicks representing the thorns) creeped him out a little bit, but other than that, a good time was had by all. Oh, it is SO ON next year.